Ray A. Myers, contractor, and Larry Norman, commissioner. Rear row, left to right: George Hjelte, manager of Recreation and Parks Commission and Walter H. King, field representative for Mayor Poulson. 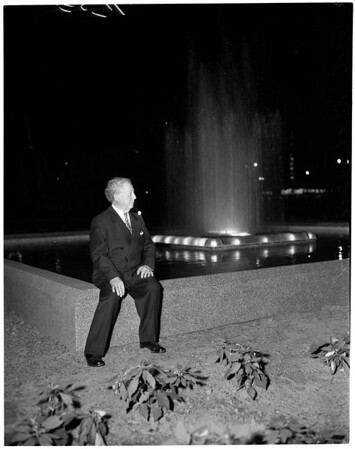 51/52: Left to right: Kelly Roth and Commissioner Larry Norman inspect fountain in operation. Kelly Roth sits beside north fountain”.